The solution in one sentence: it’s most likely the .android_secure folder in the root of your memory card that’s causing the Play Store (formerly Market) errors, where Android 2.2 and above stores all apps installed to the SD card – deleting it and starting over might solve the issues. A more detailed explanation and other popular solutions below. Go to Settings > Applications > Manage applications on your device and locate the Google Play Store in the list of installed applications. Tap on it, and clear both its data and cache from the resulting screen. If the Play Store won’t show all your installed apps under the Downloads section, this will likely fix that issue as well. Put your phone in Airplane mode, turn on the radios again and then try to download apps from the Play Store. Try to download applications over Wi-Fi instead of over 3G, and vice versa. Make sure your phone recognizes your SD card. Try turning off your device, taking out the memory card and putting it back in. Then check with a file manager on your phone that the SD card in fact can be accessed properly. For some people, going to Settings > Applications > Manage applications, locating the Play Store in the list of apps and then tapping the button that says Uninstall updates seem to work. 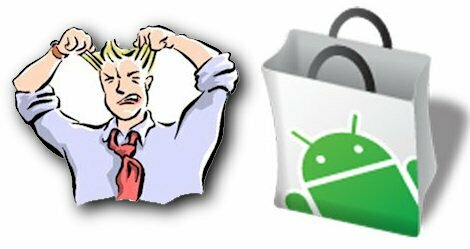 Two common Android error messages that have managed to drive many increasingly frustrated users loco are “download unsuccessful” and “installation unsuccessful” when trying to download apps from the Play Store. These Play Store issues are even worse than the familiar “phone storage is getting low” message, since there is no obvious way to solve the problem. The Play Store errors are especially common on phones running Android 2.2 Froyo or above, and for people who use the setInstallLocation 2 trick, or A2SD+ that lets all apps be installed to a partition on the SD card. That’s because it’s most likely the folder .android_secure in the root of your memory card that is causing the unsuccessful Play Store downloads and installations. This is the folder where Android 2.2 stores all apps that you’ve installed to the SD card. If the folder is corrupted somehow, or the Play Store gets confused by it for one reason or another, you won’t be able to download or install apps. The solution is to delete the .android_secure folder and let Android recreate it. If you have a rooted device and use A2SD+, make sure you move all apps to the internal memory (which with A2SD+ in fact is a partition of the SD card) before deleting the folder. You can do this from Settings > Applications > Manage applications > On SD card. If you don’t use A2SD+, move as many apps that can fit on your internal storage, uninstall the rest and reinstall them after deleting the .android_secure folder. If you want to do a full-on assault on this problem, a hard-reset is recommended as well. That’s what I did. This method usually solves the Play Store download/installation unsuccessful issue – hopefully it will do the trick for you as well. Let me know how it goes.